Cufflinks are minor works of art, offering men the possibility to wear their personalities on their sleeve. This enables the expression of personality in two different ways: the mere fact that a man uses such an accessory says a great deal about his attention to detail. The design and materials of the cufflinks represent personal style and are worn to appear simultaneously fashionable yet remaining formal. Gone are the days when the business world would tolerate slobbery. Enter the fashion forward man of the 21st century. Not the dandified metrosexual kind but the one who won't tolerate ruby eyed skulls, golf themed anything or (gasp!) silk knots. 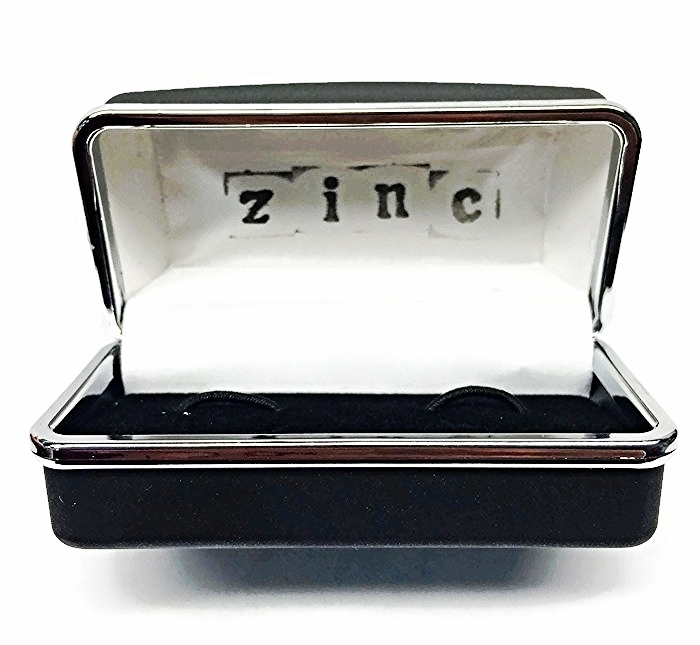 zinc was born from boring. As with many things, zinc was born from a desire to be different. Different how? Well being a pleated pant wearing, rubber soled kind of non-dandy, zinc's creators felt it necessary to craft a style that drew attention away from the everyday gray/blue business wear. Socks wear out. Men needed something that flashed taste and lasted for more than a year.